This involves connecting a house to a public or private water network via a specific pipe, usually made of PVC or polyethylene. In the house, the connection can lead to a single tap or to a system of pipes with several water taps. Private connections are the top of the line service in terms of providing drinking water. In developed countries the percentage of the population with water service in the home connected to a main network is very high, especially in cities. In poorer countries only a small portion of the population can afford the cost of installing a private connection. 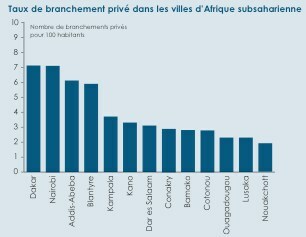 In Nouakchott (Mauritania) and Port-au-Prince (Haiti), there are fewer than 2 private water connections per 100 residents. - Improve water demand management and also improve water conservation. To install a private connection, you need to connect to the water distribution network pipeline. This is generally done by the local government or the distribution company, who will connect to the pipeline and run the pipes that will bring water to the house. They are also in charge of supplying the meter that measures the volume of water used by the household. The meter should be installed so that the quantity of water consumed can be easily read. There should be no constructions built or trees planted on the land above the pipes so that maintenance can be carried out on them if necessary. Installing pipes within the house, after the water meter, is generally the responsibility of the user. There are many ways of setting water prices. The main methods are summarised in the table below. The selection of the pricing policy is a very important choice to be made well before a water connection campaign because connections mean people will have to make payments, even if the price is most often much lower than those practiced by small, local private operators. The system chosen has a considerable impact on poor families’ consumption, because in many regions they do not have the resources necessary to pay for 20 litres a day, the volume that the World Health Organisation (WHO) judges to be the necessary minimum. Table 1 : Types of water pricing systems. - The price of water delivered through the connection to a public pipe is most often much lower than water purchased from water vendors or other small private operators. - The high quality of water from a private connection reduces the risk of water related illnesses and those related to a lack of proper hygiene, such as dysentery or cholera. Sick people often cannot go to work or school, which makes a family’s poverty more acute. A supply of good quality water can represent considerable savings for the State in public health expenses. - A private connection cuts out the time that must be taken to fetch water from collective water sources. Fetching water takes time and energy that could be put to better use in more profitable enterprises and it often prevents children from attending school. - The cost of installing a private water connection is often too high for very poor families, and for this reason, government subsidies or other solutions, such as low-cost connections or condominium networks (see file A16) are necessary. - The characteristics of the poorest neighbourhoods and shantytowns, often located on slopes, floodplains or areas that are difficult to access, including unplanned areas with a high population density, can provide real technical challenges for the local government or distribution companies. The price that a household with a private connection pays, as well as the initial cost of the connection to the distribution company’s network, varies according to the town, the pricing system and the subsidies available. The investment required for a private connection can also vary depending on the distance to the mains. In Addis-Ababa (Ethiopia) the rates increase depending on the volume of water consumed. However, the price of water delivered through a private connection is lower than water purchased at standpipes, for example. As for installing a private connection, the official charge is often smaller than the real cost of a connection. The following table shows the difference between the official rate and the real cost in Ghana and India. Even after subsidies, the official price in these two countries (and in most developing countries), about 100 USD, remains prohibitive for very poor families, considering that the poorest populations often live on less than $2/day. In Addis-Ababa, a poll of 105 households in the town’s poor neighbourhoods showed that 45% of them do not have private water connections, even though this is a town that is far ahead of Conakry (Guinea) Ouagadougou (Burkina Faso) or Nouakchott (Mauritania). While connecting to the public network is often the best way to get easy access to water at home and have water at a lower cost and of better quality than what is available from water vendors (depending on the town it is 10 to 50 times less expensive), the cost of the connection itself is often too high for families of very modest means. According to the UNDP, the average cost of connecting to water mains in recent years has been around $41 in southern Asia, more than $100 in Benin, Kenya and Uganda and $128 in South America. This represents from three to six months salaries for a worker in Kenya, two months in Madagascar and more than a year in Uganda. The cost of a connection then constitutes the main barrier for these families to gaining access to a water network, all the more so because in addition to the price of installing the connection, there is almost always the base service charge for a water connection, similar to electricity or telephone bills. Luckily, there are several ways to decrease the cost or to make it more easily attainable. - the most common way is provide simplified pay schemes. Public authorities, local governments or water companies offer low-income families the possibility to pay for their connection over several months, or even several years. Examples : payments made over 5 years in Manila (Philippines), 7 to 10 years in Tangiers or Rabat in Morocco. - some local governments provide special subsidies or subsidised loans, sometimes setting up special funds specifically for this. - other governments or associations offer individuals micro-credit. As part of some large water capture projects and some OBA-type (Output Based Aid) international contracts set up in the context of a predetermined social commitment, the World Bank sometimes gives large subsidies in order to create low-cost connections. - In West Africa, the CREPA (Centre de recherche pour l’accès à l’eau à faible coût, the Centre for Research on low-cost water access in Ouagadougou, Burkina Faso) has demonstrated the effectiveness of creating a fund to facilitate poor households’ access to a water distribution network and particularly to help them bear the cost of a base service charge. This fund lends the price of the base service charge to the household and that loan is then paid back along with the water bill. In order to help them put money aside, a specific account is set up for every household concerned. At least 100 francs CFA (15 euro cents) are paid into the account per day, and these payments are monitored weekly by a committee, so that the cost of the basic service charge is spread over several months. - In Morocco, as part of a major OBA contract for water capture and improving sanitation in the cities of Rabat and Tangiers, the company Veolia Environnement cooperated with the local government to set up a system to provide the poorest households with a connection, both for water and for sanitation as part of programme to provide low-cost connections. - PS Eau This association published an interesting document in French in conjunction with the Water Utility Partnership for Capacity Building (WUP) Africa “Improving poor urban populations’ access to drinking water and sanitation – Collection of good practices in Sub-Saharan Africa”. Dakar, 2004. See pages 21 to 44.